The juicy pear pairs well with the sweet almond cream. Two flavors so meant to be! So incredibly tasty. If you have not noticed my addiction for everything almond yet, you can see it here, also here and even here with bananas. 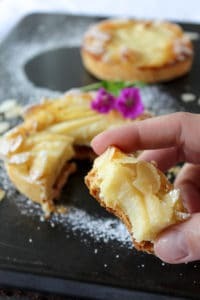 But this French almond pear tart is a French classic also called Tarte Amandine. What I like about certain recipes like this one is that you can bake it all year round. Pears are pretty easy to find any time of the year. Score! A recipe in your repertoire you can bake and enjoy literally ALL THE TIME. Almond meal is actually a staple in my house. I really stresses me out if I run out and don’t have extra. I’m like that for a few ingredients lol! 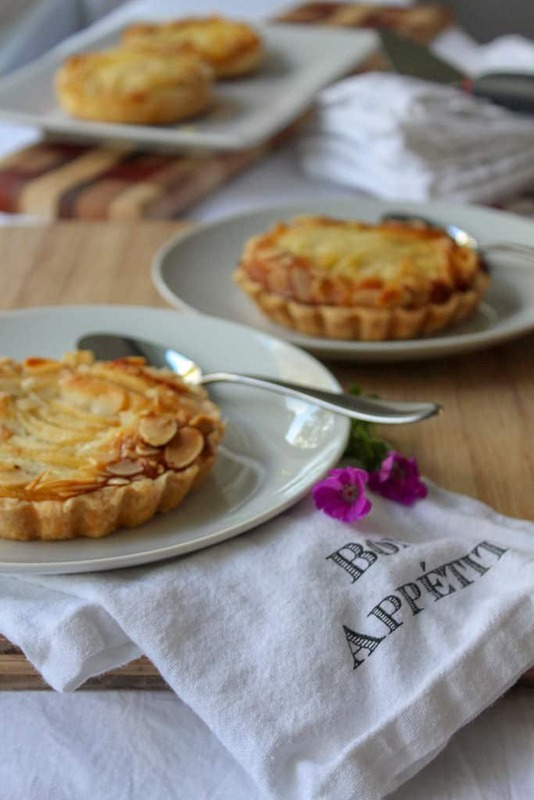 Tarte Amandine will be found in French bakeries in individual forms but also full tart size. It’s the perfect ‘gouter’ (4pm French snack) with your coffee (or tea). It also presents well so it can also be a great dessert to bring to a friend’s dinner. ALMOND CREAM: Just a few ingredients in a bowl and mix. Easy peasy! My kids do it while I prepare the crust. PEARS: not a fan? change it for apples if you wish. 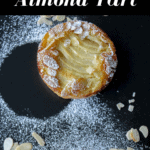 French Tarte Amandine pairing the juicy pear and the sweet almond cream. Pre-heat the oven at 350C. In a bowl, mix the eggs and sugar until lighter. Mix the butter, the flour and salt together until it is crumbly. Add the water at once and mix gently to form a bowl of dough. Don’t over-work it, just enough so all the crumbs are all picked up. In individual tart molds (3 inch diameter), put the rolled crust. Pour some of the almond filling in each – probably the equivalent of 3-4 tablespoons – give or take. Don’t over fill it, the pear will overflow it otherwise. Add half of a pear slices in each mold. Bake for 20-25 min in the over (previously pre heated at 350C) until golden if you are making individual. Bake 40 min if you are making one big tart. Absolutely beautiful. Simple, yet amazing. Bravo! These look gorgeous, I’m not a fan of pies but I’m a sucker for individual tarts. Me too Ayngelina! I even prefer individual ones, more buttery crust! These look so elegant and delicious! Beautiful photos. Oh my gosh, thank you so much, it means a lot given the amazing pictures you guys take! Can I substitute margarine for the butter?